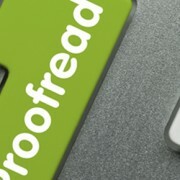 Proofreading content is something that is increasingly important and a very specialist skill. Often this stage of the writing process is neglected. However, it is as important as the writing itself. Before considering the use of proofreading services you should follow some simple steps that will help you to ensure that your work is error free. When proofreading your own work it is essential that you break down the process of proofreading into the before and after, to ensure that your proofreading session is most effective. First you should ensure that you have completed and revised all the larger elements of your content. Ensure that the content, sections, paragraphs and organisation of your text are complete. Take a break and do something different between the process of writing and proofreading. This time away will help you see mistakes more clearly, constantly looking at the text will only make you accustomed to seeing the text as it is therefore making you less able to pick up on errors. Attempt to eliminate unnecessary words prior to proofreading. Work on making your work clear and concise by using fewer words to make your points. This is the best way of ensuring that your writing has clarity. The first thing you should do is to print out your work, looking at a computer screen will strain your eyes and will only reduce your concentration faster. Also consider reading out loud, this is particularly helpful for spotting run-on sentences, you will also hear other issues that you may not see when reading silently. Use a blank sheet of paper to cover up the lines below the lines you are reading, this technique will keep you from skipping ahead of possible mistakes. If you tend to make many mistakes, check separately for each kind of error, moving from the most to the least important. For instance, read through once (backwards, sentence by sentence) to check for fragments; read through again (forward) to be sure subjects and verbs agree, and again (using a computer search for “this,” “it,” and “they”) to trace pronouns to antecedents. End with a spelling check, using a computer spelling checker or reading backwards word by word. But remember that a spelling checker will not catch mistakes with homonyms (e.g., “they’re,” “their,” “there”) or certain typos (like “he” for “the”). A professional proofreading service will ensure that your work is not only free from spelling mistakes and grammatical errors but would also check syntax and sentence structure. There are many proofreading services online it is therefore important that you research this area to find the right one for you. Finding a reputable proofreading service that can make the most impact on your work will take some time, however it will be worth it in the end.